Vice-Dean of Marketing in the School of Business Sciences. Professor in the Department of Marketing and International Business and researcher at Universidad del Pacífico Research Center. She holds a degree in Management from Universidad del Pacífico and an MBA with a major in Marketing and Strategy from the Rotman School of Management, University of Toronto (Canada). She is a consultant specializing in marketing, innovation and strategy, and is currently pursuing doctoral studies at Universidad ESAN. She has been a professor of Consumer Behavior, International marketing, International business and Innovation management, among other courses, both at undergraduate and graduate level. In addition, she is currently conducting research on emerging markets. She has over 10 years of experience in the areas of marketing and strategy and more than 6 years dealing with topics related to innovation consultancy. She has worked as a consultant for Designworks, a boutique consulting firm focused on innovation and design thinking; and for Accenture Canada, dealing with marketing consulting projects for clients in the Retail, Finance and Health industries. 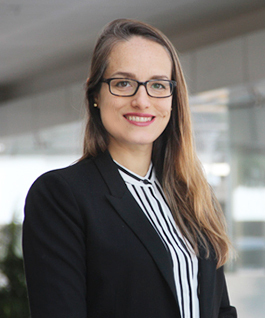 She has been marketing manager for McMillan Canada, managing the Toronto office for more than 3 years, and commercial manager for APOYO Innovación Organizacional in Peru. She has worked as a consultant in strategic marketing and innovation projects for several national and transnational companies. Consumer behavior, strategic marketing, innovation, entrepreneurship.